Certified Instructor Yoga For Seniors. Gift certificates are available for private one-on-one sessions, yoga parties and retreats. I believe everyone can benefit from yoga. Yoga should be physically accessible to people of all body types, fitness levels and ages. It is fun and rewarding to see personal physical improvement and be able to accomplish a pose, but yoga is much more than that. When yoga combines the physical pose (asana), breath work (pranyama) and meditation, it can bring you to a calm inner awareness and strength. Since completing my initial teacher training in 2010, I have taught yoga to a wide variety of students - from the high school soccer team to seniors in an assisted living setting. I have learned to adapt yoga poses and principles to fit the needs of my students. One of the most challenging and yet rewarding opportunities was teaching yoga to a combination of seniors and 1st graders! My training as a special educator taught me to break activities into small steps. I am eager to adapt that skill to yoga and help you make the adjustments needed for your own personal yoga practice. I offer public classes, small group or private instruction to all ages, physical abilities and levels in the Woodland Park/Westcreek area of Colorado. 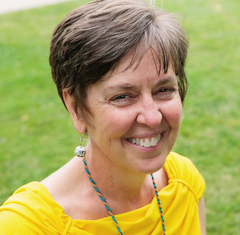 "As a life-long 'inflexible' person, Linda has been a blessing. Because I cannot touch my toes, yoga seemed to be the right place, but I always feared it was only for the bendy types. With Linda, that's not true. She meets us where we are and modifies poses as we need. I have LOVED attending her classes and becoming a more flexible person!" "I appreciate that Linda takes the time to understand individual student's needs. She honors what you are able to do and offers modifications to make the practice available to all." "I have been a casual yoga student for a number of years under a variety of instructors. Linda stands out for her attention to her student's needs and abilities. She offers options to each move or stance so that every student, whether beginner or advanced, can come away feeling like the class was tailored to them. A class with Linda is refreshing, both mentally and physically, and always enjoyable."